Let’s go through creating a users export step-by-step together! This guide is targeted towards Laravel Excel 3.0 beginners. It hopefully gets you more acquainted with the way of setting up easy exports in your Laravel projects. In case you will be doing this in an existing project, you can skip this chapter. Let’s start of by creating a new Laravel project. The easiest way of doing this is by using the Laravel installer. This should have created a new Laravel project in the export-project folder. Next you should adjust the .env to have your database credentials. If you are unfamiliar with any of these things, don’t hesitate to check the Laravel documentation (https://laravel.com/docs/). As we are going to create a users export, we have to make sure we have a Users model in our project. If you have just installed Laravel, this should be present in the project. There also should already be a users migration in database/migrations. 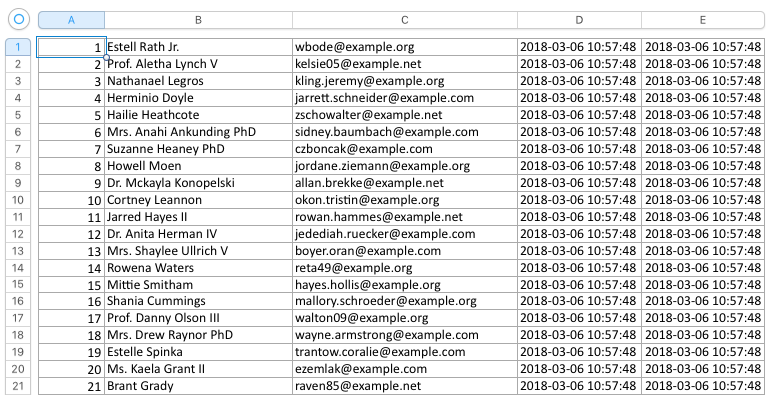 Let’s use the default database columns to get started with this. This should create 100 random users in our database. 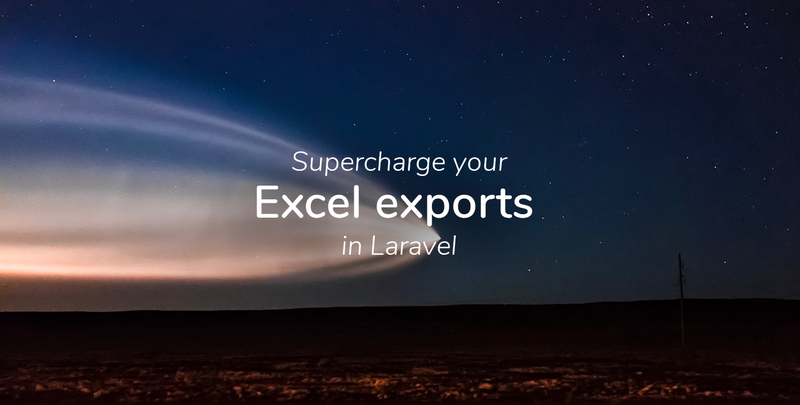 Let’s start supercharging your exports! Installing Laravel Excel is very easy. Run the composer require command first. When composer is ready, both the ServiceProvider and facade should have been auto-discovered, which means you won’t have to do anything else to install Laravel Excel! To create an Export class you can either manually create a class or just use the provided artisan command! This should have created the following class in the app/Exports folder. You might notice the FromCollection concern. This interface tells Laravel Excel that we are going to create an Excel file from a collection. The interface enforces a collection() method. In this method a Illuminate\Support\Collectionneeds to be returned. The next step would be to hook up the UsersExport class to a controller, so it can be called by the user. Let’s create a controller first. In this controller add a export() method and call the download function on the UsersExport class. 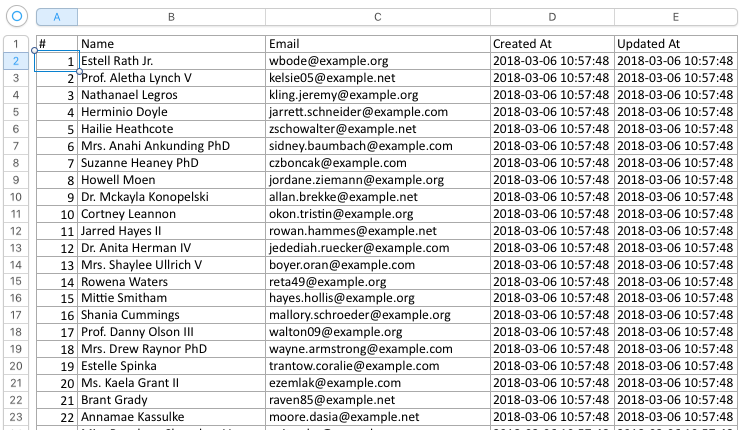 In this method we use the download method on the Excel facade. This will make sure the file will be downloaded to the user. The first parameter supplies the export class we have just created and the second parameter the filename that we want the downloaded file to have. If you now open the https://export-project.test/users/export url, you’ll find a nice users.xlsx file in your downloads folder! As you might notice there’s no password column in the file. This is because Laravel Excel only uses visible attributes by default when exporting your models! The export doesn’t contain a heading row right now, but we can easily add that. Let’s use the WithHeadings concern for this! When you export the file now, you’ll see a nice heading row!